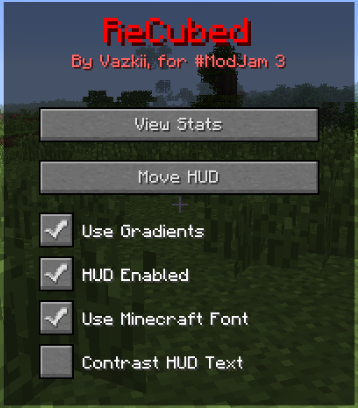 ReCubed Mods is specialized in statistics, or we can call it a statistics mod. This mod shows you all sorts of stuffs including stuffs you may or may not want to know. In-depth statistics of everything that happened. Real time pie chart and scoreboard stat visualisation (with configurable update interval). 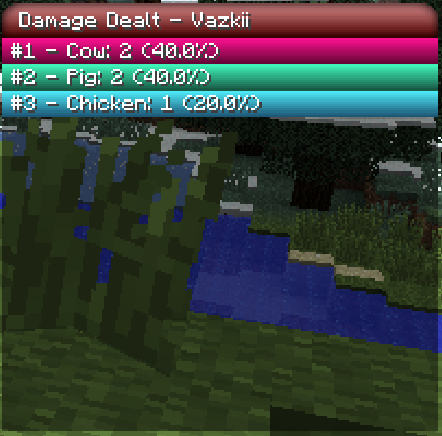 All stats get subcategories, so for example, Blocks Broken shows how many blocks of each type you broke, Damage Taken shows what type of damage you took, etc. Using the mod is simple, to start off, open your inventory and click the little cogwheel next to your character (if you don’t like this, you can swap it for a keybind in the config file). You’ll get the above screen. There’s a few options in the bottom, mess with them a bit and look at the bottom right corner of your screen to see the changes. You can press Move HUD to change where it’s at. (tip, use the WASD keys to snap the HUD to the corners of the screen!). Pressing View Stats will open the stat viewer screen. This is where it all happens. The list on the left shows all stats being tracked (stats in grey are stats you have no data on). Clicking one of the stats will show a pie chart of the top players (the pie charts only show the 10 most prevalent entries to prevent clutter). You can click the players’ slices of the pie to view their stats, or type in someone’s name to view their stats (case they aren’t in the graph). Clicking “Your Stats” on the bottom shows you your stats. When viewing stats, if you want to see what values a stat has, if the stat isn’t present in the pie chart, simply typing it in will let you see what values it has. Lastly, pressing ENTER will track the stat you’re looking at (be it the top players or the top stats for a given player). 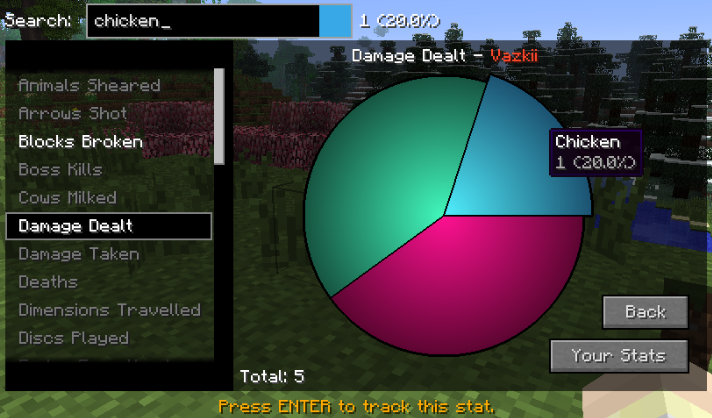 This is the Ingame HUD, it displays the top 15 values for any stat you chose, in a scoreboard format. If you’re looking at the stats of a player, anything below that gets coupled into an “others” stat, if you’re looking at the top players and you don’t happen to be in that list, you’ll still appear at the end, alongside your rank in the server. If you are a server admin, be glad to hear that there are some commands for you to use. These commands can be restricted to a specific set of players in the config file if you so desire. Sets the frozen flag of a category, if a category is frozen, the stats there stay constant. Sets the frozen flag of ALL categories. Clears all the data in a category. Clears all of a player’s data in a category. Wipes ALL data portraying to a player. Saves all the current data in a backup of the name given. If a backup of that name already exists it’ll overwrite it. Loads the backup (if existent) of the name given. If a backup of the name given exists, deletes it. If you are still confused to what category you need to manipulate to what effect, look in the localization file, the display names might help you find what you need. For example, the category displayed as “Experience Collected” is, in code, “experience_gathered”.